I signed up for e-mails from Hitched Salon in Georgetown when I first started looking for my wedding dress. The post about the sale at Carine's reminded me that I had an e-mail in my inbox from the Hitched gals about their sample sale! 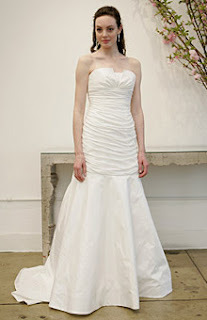 This coming Thursday, June 12, from 5pm to 8pm, Hitched will be offering a selection of sample gowns at a discount. No appointments are needed, but they do recommend arriving early! There are photos on the Hitched Website (click on Sample Sale) of some of the dresses available, but I've posted two of my favorites below. use of fabric to create unique details on quite a few dresses lately. I think it's a nice alternative to lots of beading or sparkles. I'm a big fan of all-over lace dresses too! And how often to do you see a non-strapless wedding gown? Oh, and can't forget the shoes!! Imagine these lil' cuties in baby blue with white stitching. 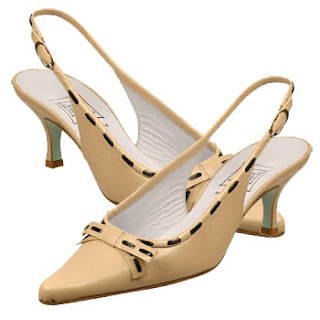 they are adorable, nice low heel and comfy too. the blue version specifically for Hitched. All you brides looking for something blue, be sure to check out the sale. Oh my goodness I tried on the blue Cynthia Rowly shoes too! I didn't get them cause the heel was too low, but they were so comfy. This is going to sound crazy but I think I might buy them just because, haha. No wedding needed for great shoes. Have you thought about having your dress made? I was a big fan of the all lace dress, but they were all way out of my price range. I found a dressmaker, who is by me in Philadelphia, and she is amazing and saving me sooo much money.